This week is all about the cheek products. When on holiday, I like to add a bit of colour to my face in the evenings, just to enhance the natural sunkissed glow. Sometimes when you put makeup on top of your glow, the wrong shades/tones can make you look a little dull, so I decided to bring a bronzer in case nothing matched. I used this a few times when I was wearing makeup in the evening, but like I said in last weeks series, I didn't really use foundation that much and so it wasn't really needed. It's good to have a bronzer to help match your foundation down your neck too, or even out your skin on any dodgy bikini lines. I wasn't too bothered about having a chiseled cheekbone, but I did use the highlighter a lot in the evenings. It's nice to have a pretty glow and it makes you look healthy too. I would just apply a small amount on the tops of my cheekbones. I like that this product is a duo as you don't have to carry two different separate items. Like many people, I like to switch up my blush shades and I don't currently have a top favourite that over rules the others. So I thought this trio would be ideal for my holiday. It has two shimmery powders and one cream blush in the middle. I like putting the cream blush on as I find it looks more natural and I can use my fingers to apply it. But sometimes in the evenings, when you want your blush to stay on for longer, it's nice to wear the powders. The powders in this trio have a little shimmer to them so you don't necessarily need a highlight if you want. 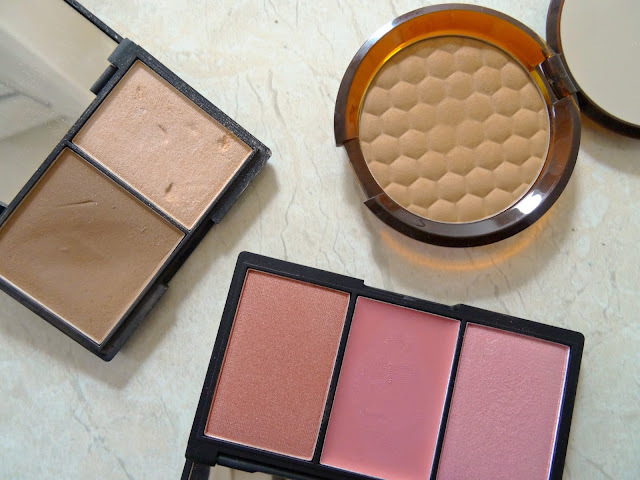 I love sleek blushes, they have such pretty colours and they're always really pigmented :) Really want to try that body shop bronzer, I've seen so many rave reviews about it!